It's been a weird year or so for my love life. For a while I dated Daniel, who I liked very much, and yet I was attracted to Zack, the police detective. It was odd to like two fellows for different reasons at the same time; it was like a dead even tie, in a lot of ways, between the two guys. But then Daniel went back to his ex, and Zack moved on to greener pastures, never interested in me that way anyway, which was fine. We were so different, it never would have worked. The tie between them was never real, in a way, because both guys had other women who appealed to them more. And then... and then I met Jakob Müller. He saved me just by being in the right place at the right time (No Mallets Intended - November 2014) and he - amazingly, to me, after Daniel who seemed to think I needed a keeper - appears to trust that I can take care of myself. Sigh. Christmas tree farmer, junk stop owner (his store is called The Junk Stops Here; how perfect is that?) and hunky single dad to an adorable daughter who I loved immediately... Jakob Müller. So now I'm in that pleasantly awful stage of a relationship when I know how I feel, but I have no real idea how he feels. And I know he has to be careful, with a daughter to think of. And I want to reassure him that we can take this as slow as he wants, but I don't want to presume anything, like that he even likes me that way. Maybe I'll have to make the first move... kiss him, or something. Meanwhile, I have a lot else to think about, (like my editor's son being accused of murder) so I'll take this one day at a time. And hope for the best. Have you ever been unsure, in a relationship, where you were headed? And afraid to ask? To the wonderful readers of Vintage Kitchen Mysteries: There has been a lot of talk lately about the cancellation or non-renewal of cozy mystery series. There has been no renewal of the Vintage Kitchen Mysteries by Berkley Prime Crime HOWEVER, good news! The series is going on with or without them! In fact, failing a renewal by Berkley, Beyond the Page will be publishing Book #6, Leave it To Cleaver, in which BIG changes are brewing for Jaymie! To celebrate that, AND to celebrate that White Colander Crime has been nominated for a Bony Blithe Award for Light Mystery, I am giving away TWO signed copies of White Colander Crime to two commenters here! Please write, in your comment, your name and an email address... you can write the email address as yourname (at) yourserver (dot) com if you'd like to fool the spambots. AND, please comment by Midnight tonight, Thursday, April 21st, 2016! Open to Canadian and US addresses! I'll choose two random commenters! How exciting! 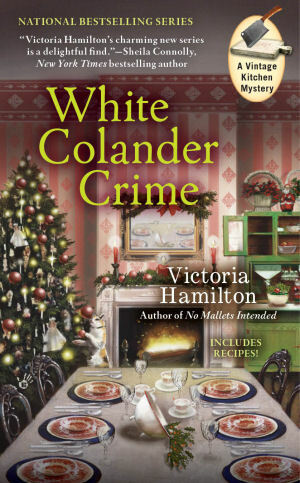 I am so glad the Vintage Kitchen Mysteries series will still be continuing, and congratulations for White Colander Crime being nominated for a Bony Blithe Award. White Colander Crime sounds like a wonderful read. 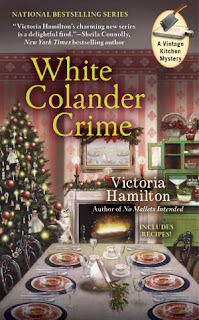 I would love to read White Colander Crime—thanks for the chance to win a copy! I would love to read this one and to answer your question, I have been in a relationship and not been so sure. Thanks for the giveaway. Glad the series will continue. Yes, I have been afraid of where some relationship has been headed. Particularly, some close friendships of mine! Sherylhbooth (at) gmail (dot) com I am so thrilled that this series continues on. This is great news! 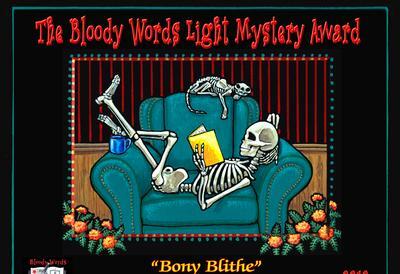 And congrats on the Bony Blithe award nomination! How exciting! Glad to hear things will continue with Jaymie, no matter what! I'm very glad the series will continue. I love it. Thank you for the chance! So glad you will continue the series. And congrats on the nomination. Congrat's on the nomination and thrilled to hear the series will continue. 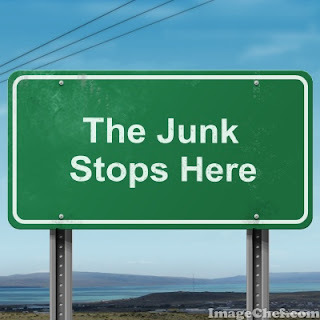 Congrats on the nomination and how perfect is the name The Junk Stops Here. Congratulations! Since I've already won White Colander Crime from you several months ago, I will opt out of the contest... but wanted to comment to let you know how happy I am that your series will continue!!! I am thrilled to hear that the series will continue. There are very few books that I can say have drawn me in from the very begging. But each one of the Vintage Kitchen books has done just that. Thank you for granting me that time away from my work and family responsibilities! I love reading cozy mysteries. I would love to win. Thank you for the chance. I own three of the five published books in this series. I'd love to win the fifth book AND have it as an autographed copy. I love the series and am glad that if Berkeley stupidly doesn't renew that you have another publisher waiting in the wings. Congratulations on the nomination! And I'm glad you are continuing the series! The vintage mysteries bring back good memories of all the things in my grandma's kitchen ---as well as being super fun reads. Thanks for the contest. This is great news!! And thanks for the chance to win! That is happy news! Great series, love those covers, too. Thanks for the giveaway. Great giveaway! Thanks for the opportunity! I never win, but I always try. I am a HUGE fan of cozies. I am so glad to see that this series is going to continue. This is a great series and can't wait to see what is in store for Jayme in Leave it to Cleaver. Great giveaway, thanks. The way publishers have gotten so cavalier about cancelling book series is very distressing and quite annoying. Let us read and let them weep! I think I'm taking a trip to the little bookstore by work at lunch today to see if they have A Deadly Grind so I can get started on this series! Thanks for sharing!!! Sounds like a real winner to me. Thanks so much for the chance to win it. Nothing like a cozy to make your day. I love cozy mysteries. I can read and my husband the cook can test your receipe!! Congratulations on your award!! How wonderful that your Vintage Kitchen Mysteries will continue on! And congratulations for White Colander Crime being nominated for a Bony Blithe Award. Thank you for the chance to win! I shared my with my cozy friends from Cinnamon & Sugar & a Little Bit of Murder's blog. I have wanted to start this series! Hope I win! Good luck everyone! Say it isn't so!!! How can Berkley not want to publish more books in the Vintage Kitchen series. I love this series. It is one of my favorite series. I would love to win a signed copy of any book in this series. I am glad the series will go on. I love this series, and so glad that we can continue the journey. Oh my gosh!!!! I'm not entering the giveaway, since I already have the book. But congratulations!!!! I can't wait for MORE books. I love cozies, and this one sounds good! Thanks for the chance. Congratulations on the award. Hope you award me a copy of the bokk. I'm not familiar with this series, but would like to be! Congrats! This is such a terrific series and I'm thrilled that it will continue. Glad to hear the good news! I'd love to read White Colander Crime! Thank you! Exciting News then and I really like the uncertainty of the character. Yes I have been in that situation and I moved on. I hope your character has better luck. Thanks for the contest. I would love to enter. Sometimes I am unsure of my relationship with my husband and we have been married 42 1/2 years! There are days, and then there are days. Thanks for the chance to win! Congratulations on being nominated! Thanks for sharing! I would love to give a copy a happy home! Congratulations for being nominated for a Bony Blithe Award with White Colander Crime. And great news that you are continuing the series! Thanks for the chance to win! My now husband told me in 1976 we were going to get married. It didn't work then, but after not talking for years, we got married in 2014. I guess he knew where we were headed. I'm so glad the series is continuing. It's always so disappointing to learn that a much loved series is going to be discontinued. I'm thrilled this one is going forward. Thank you so much for this wonderful chance to win. Congrats on the nomination. Love to win this!! I would love to win a copy of White Coloander Crime. I so want to read this series. So happy the series will go on no matter what. Love the characters. kchinetti (at) gmail (dot) com. Thanks, all!! I'll be informing the winners later today.